Many years ago (well about ten), in my northern Sydney suburbangarden, I planted my first Grevillea ‘Firesprite’ which is a hybrid between Grevillea longistyla (female) and Grevillea venusta (male). My plant has now grown into a large shrub about 4m high x 3m wide with a mid-dense habit. I am growing it in a position that receives sun nearly all day and is planted in a thin layer of soil over a clay base. Despite receiving no supplementary water from me, it thrives and is far too large for the position I planted it -- on the nature strip. However it is quite happy to be pruned back hard and after doing this, it regrows quickly. It is also reported to be moderately drought and frost hardy. 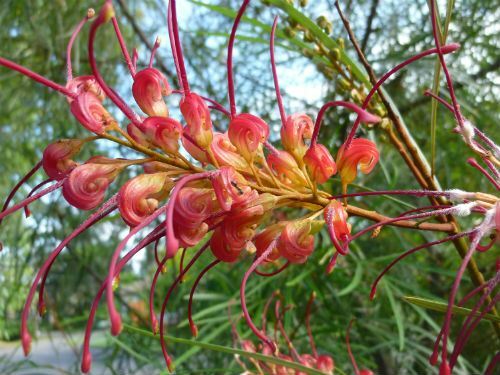 Grevillea ‘Firesprite’ is a great feature plant OR a screen plant if you require something other than the many varieties of the native Lillypillies. It is also a great bird attracting plant and flowers in spring. I have also seen many of them planted in Perth, so it is versatile. Maintenance. None to speak off except for the occasional prune to keep it in check. Derivation of Name: Grevillea...after Charles Francis Greville (12 May 1749–1809, co-founder of the Royal Horticultural Society. A younger son of Francis Greville, 1st Earl of Warwick, he was a British antiquarian and collector. Charles Greville remained for years a very close friend of Sir Joseph Banks and, like him, a member of the Society of Dilettanti. He accompanied Sir Joseph at the organizing meeting in March 1804 of the precursor to the Royal Horticultural Society, the Society for the Improvement of Horticulture. At the age of 23, he began his spectacular meteorite collection which eventually amounted to some 14,800 specimens. It was sold to the British Museum after his death.